New Orleans, LA, May 8, 2012 – Legacy Capital (www.legacycapital.com) announced today that its clients, New Orleans, Louisiana-based M.G. 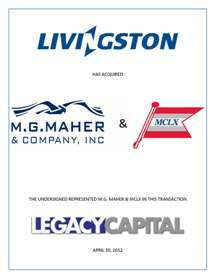 Maher & Company, Inc. and MCLX, Inc. (“Maher”), have been acquired by Livingston International. Maher was advised by Legacy Capital, a New Orleans-based investment banking firm. This latest acquisition by Livingston International strengthens Livingston’s international freight forwarding and customs brokerage businesses in the U.S. and internationally. It also establishes Livingston in New Orleans and expands its operations in Houston. Established in 1949, Maher is an international freight forwarder, customs broker and logistics provider employing approximately 100 people in New Orleans, Louisiana, and Houston, Texas. The company has over 60 years of experience providing first-class global shipping services for companies that span all industry sectors. Not included in the transaction is MBLX, Inc, an affiliate company of Maher that provides barge freight handling and transportation logistics. MBLX will continue to operate independently and provide clients of both companies the same services it does today. Legacy Capital offers unparalleled investment banking services to private companies, specializing in mergers and acquisitions and private placements. The firm’s experienced team of professionals is dedicated to providing comprehensive representation and advisory services across a broad range of industries. Legacy Capital creates solid relationships with its clients through personalized service and by delivering exceptional results. Legacy Capital was founded in 1994 and is based in New Orleans, Louisiana. For more information, please contact Managing Directors Marianne Van Meter or Chip Porter at 504.837.3450. A leading North American customs broker focused on compliance, Livingston International also offers customs, consulting and global trade management services as well as international freight forwarding across North America and around the globe. With its U.S. air/sea hub located in Chicago and regional centers in Los Angeles, New York and Norfolk, Livingston is a dominant customs broker along the U.S.-Canada border. Livingston employs more than 2,700 employees at over 100 key border points, sea ports, airports and other strategic locations across North America as well as in Europe and Asia.